This is usually because you have either made too many or too few stitches in a row or ended it in the wrong place – or possibly both. 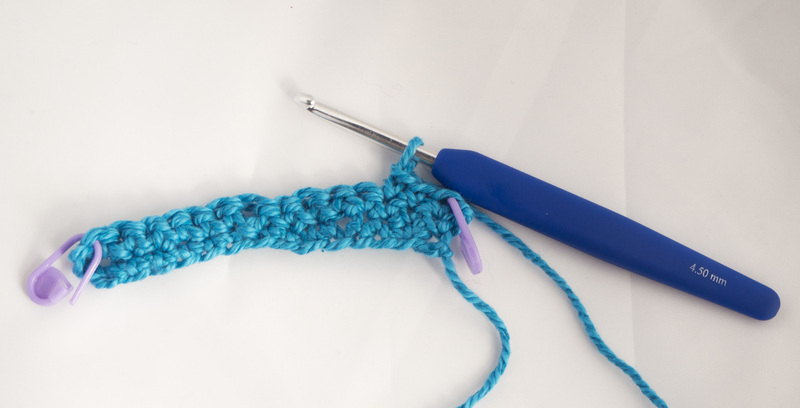 One thing people find difficult when starting to crochet is knowing where to put the last stitch in the row and this is a big factor in the problems above. Here is a simple tip to help you keep track and all you need are two removable stitch markers or safety pins. When you make the first dc of your first row place your marker or safety pin through the top of that stitch. Work across your row making the number of dcs required. When you turn and start back, put your other marker in the top of that first stitch. You can then work back across knowing the marker is in the last stitch you need to work into. Once you have worked the last stitch you can remove the marker and use it at the start of your next row. Now you need to check that you have the right number of stitches. 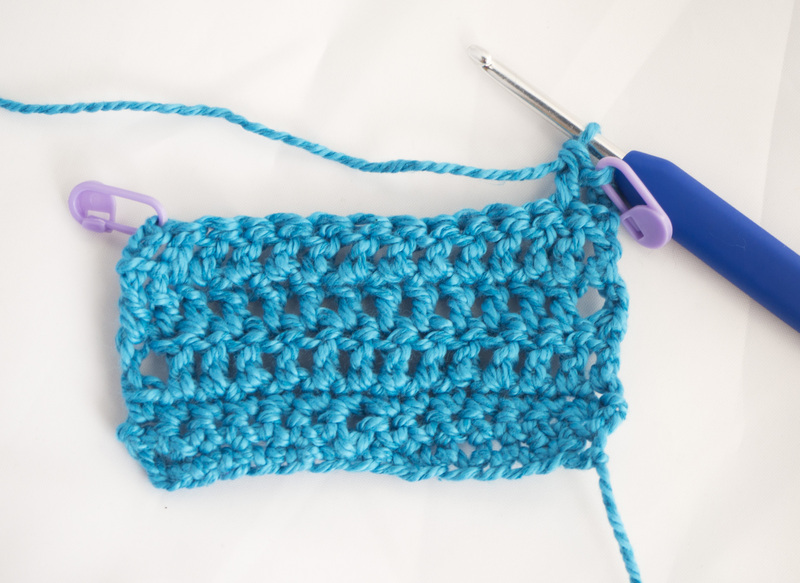 With double crochet it can be easiest to count the flat vees on the top of the stitch. If you have too few stitches when you have worked to the marked last stitch you have missed one or more out on the way across. If you have too many, you have probably worked two stitches into one from the row below. In either case it is better to rip out the row and try again. When you are working with taller stitches like trebles, the row may start with a turning chain that counts as a stitch. In that case your marker goes in the last stitch of your turning chain. Work across the rows as before, working into the marked chain stitch as the last stitch each time. Taller stitches such as trebles are easier to count because you can count the “legs” all the way across but you still should check you have made the right number of stitches. 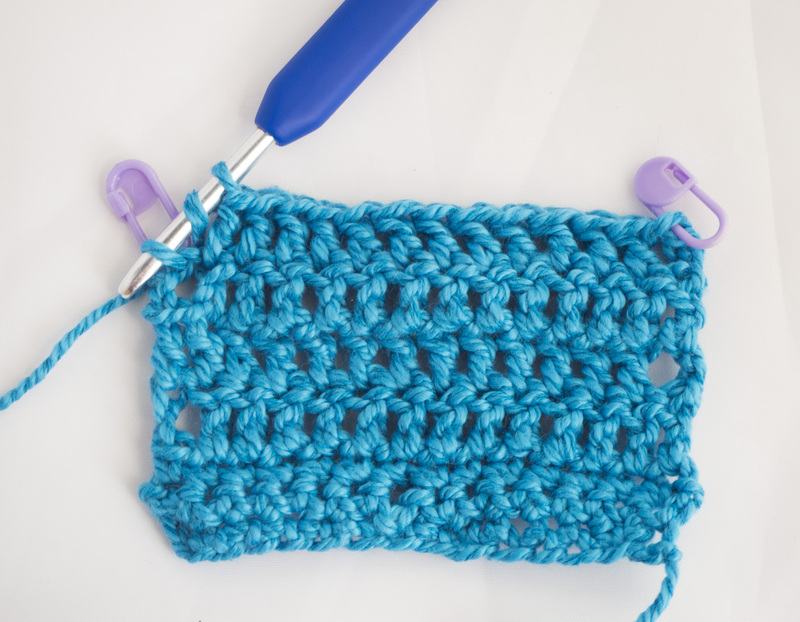 Once you are used to adding markers in this way, you can do it for more complex stitch patterns with confidence.